Larry Desmedt, better known as Indian Larry, died in Charlotte, North Carolina on August 28, 2004. When I reported his death here on September 3 of that year it drew more comments than any post in the previous history of bookofjoe. Hundreds of people from around the world, bikers and those who'd never even seen a tricked-out chopper, paid their respects. 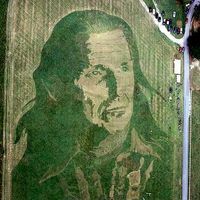 Roger Baker, an artist and sculptor in Ellenville, New York, since 2000 has annually created a gigantic portrait in grass in the landing field of the Ellenville Flight Park, where he's been hang gliding since 1975. The gargantuan annual portraits — so far they've ranged between one-half-million and one million square feet in size — began with one of the Statue of Liberty and have since featured Albert Einstein, Jimi Hendrix and Elvis. You don't see much from ground level but once you're aloft they're magnificent. in last year's portrait (top). Perhaps this will be the year Roger Baker cuts a half-million-square-foot portrait of John Coltrane, musical notes pouring out of his tenor saxophone, into a hayfield in the shadow of the Shawangunk Ridge and invites 1,000 saxophonists to show up and play. It is, after all, the time of year when he has to start planning for what must be the world's largest annual portrait, but he isn't at all sure what he'll do this year. Still, as he contemplates this year's model, people are still reflecting on last year's — the subject of a quite remarkable documentary film that will have its premiere here next Sunday. After creating similarly gargantuan field-art renderings of the Statue of Liberty, Albert Einstein and Jimi Hendrix, and a beyond-mega-size million-square-foot Elvis, Mr. Baker seemed to take something of a departure last year in paying homage to Larry Desmedt, a New York-based custom motorcycle builder and biker, better known as Indian Larry. Mr. Desmedt died in August 2004 when he fell off a bike and hit his head while doing a stunt at a show in North Carolina. But then, maybe it was not a departure at all, instead a perfect distillation of Mr. Baker's combination of art, inspiration, lawn mowing and weed whacking, another reminder that life in and around Sullivan and Ulster Counties has long since become something other than the borscht belt of old. "I was all set to do Coltrane," said Mr. Baker, an artist and sculptor who paints motorcycles, creates antique-looking signs for businesses, and fabricates commercial sculptures when not creating his colossal portraits in the landing field of the Ellenville Flight Park, where he has been hang gliding since 1975. "I wanted 1,000 saxophone players playing between 10:30 and 11:30 a.m. when the sunlight would glint off all the saxophones, and then they could all walk the streets of Ellenville playing what they wanted." And then, both from conversations he heard while working on bikes or from snippets of television reports, he became interested in Mr. Desmedt, a cult figure in the cycle world and an artist in his own way. "I said, 'This Indian Larry guy, is he fieldworthy?' " Mr. Baker recalls asking a friend. He designed the portrait, with details as exact as the tattoos on his throat, from pictures of Mr. Desmedt taken by the photographer Timothy White. Then he mapped out the field and the cutting schedule, and worked with friends and helpers using a tractor, power mowers, hand mowers and hand-held weed whackers for perhaps three weeks. Mr. Desmedt's friends and family, many on motorcycles, showed up in Ellenville around the first anniversary of his death, and those closest to him flew over the site in four vintage open-cockpit biplanes and a Cessna 172. It was all captured by the New York filmmaker Gary Planken for an eloquent documentary that will have its premiere at Ellenville's Art Deco Shadowland Theater. All this began rather casually. Mr. Baker was sitting with Tony Covelli, who owns the landing field, one day in 2000, and the conversation turned to the bull's-eye they had carved for hang gliders to land on. Why not something grander, a picture of some kind, Mr. Baker suggested. Almost instantaneously they came up with the idea of the Statue of Liberty as a piece of art to mark the millennium. "It was just meant to be," Mr. Baker said. "Everyone who flew over it just went nuts." Mr. Baker, who has a laconic, unaffected quality, seems remarkably low key about his annual epics. What he likes most, he says, is the purity of it — a bit of transitory majesty, something carved into grass, disappearing even as it's being created, no chemicals, no paints, no residue, just a bit of fleeting magic soon overtaken by grass, bugs, rain and snow. And that, he said, would have appealed to Mr. Desmedt, not a monumental figure like Einstein or Elvis, but a man who took his own private passion and turned it into something akin to public art. "He was the real deal, not pretentious; his life was his art," he said. "It just seemed perfect. I think he would have loved the impermanence of it." As for this year, well, it could be Coltrane. It could be Leonard Bernstein. It could be one of about 16 others, some just ideas, some already sketched out. All, he says, icons who carry an emotional charge for him. "I like people who are legends, people with serious fans and serious toys," he said. And then, if he gets tired of mere half-million or million-square-foot cuttings, here's his really big idea: a series of maybe five or six giant cuttings, running up and down the valley from Wurtsboro to Kingston. "It would be a great thing to do," he said, a bit wistfully, and added, "But when do you put the brakes on?" I can reach him and have him call you, send me your phone#. Does anyone know where I can find this Roger Baker? I'd like to hire him for a project. Kudo's to the grass painter. Go figure.. He's a role model and you aren't? Wonder why? Because he lived free and respected everyone else's right to do the same.. including you.. If your foot was in the other shoe, do you think he would have dishonered your death with such a comment? That's what makes a legend. Integrity, respect, and overcoming EGO. Larry reached the bar. You're still breathing because you have work to do. He died while stunting on a motorcycle, and he wasn't wearing a helmet. Great role model, really. Indian Larry fascinated me. He was one of those guys who made a lot of mistakes but managed to hang in long enough to reach a point of wisdom and peace—and a little success. It seemed like Larry had more hard-won truth to share than an auditorium of philosophers and theologians. I figured when I finished up a 6-week job in California, I'd stop by home in Charlotte, pack fresh clothes, then go look up Larry in Brooklyn, see what he had to teach me. But as I was winging my way home, Larry was being airlifted to the Carolinas Medical Center, just a few blocks from my house. What a sad, gruseome twist of events. I guess if there's a lesson, it's to go out doing what you love. Or to spend as much time doing what you love as possible, because you don't know when it will end. Live now.